Contact Gail Katz at gailkaktz@comcast.net for more information. try to start a race war by killing 9 African Americans while they were in a Bible Study in Charleston South Carolina USA. Who:Members of all Religions and Faiths, as well as all three Bahai Clusters Wayne, Macomb, and Oakland. Contact Betty or Blair to tell us how you can help! I grew up in Silver Spring, Maryland in a very non-Jewish neighborhood and I was always the only Jewish child in my elementary school classroom. Every morning I would bow my head with my classmates and recite The Lord’s Prayer – “Our Father Who Art in Heaven, Hallowed Be Thy Name, etc.” Prayer was quite legal in the 1950s when I was a child. And then there was always the December dilemma! I was always part of the Christmas pageants where my class would sing the Christmas Carols in the assembly hall – Oh Come all Ye Faithful, Joy to the World and Silent Night – all the songs with the name of Jesus in them. I knew they were not my songs, but I did not want to be singled out as the only one not singing with the rest of the school. My teachers always pointed to me, the Jewish kid, to explain the meaning of that “Jewish Christmas” called Chanukah, and I had to bring in the menorah and stand in the front of the class and talk about what it was, underscoring how different I was from everyone else. My parents were very secular Jews, and went to the synagogue three times a year – twice for Rosh Hashanah and once for Yom Kippur, the holiest days in Judaism. Even in the synagogue, I felt like an outsider. My brother went to Hebrew school and learned the Hebrew prayers for his bar mitzvah. I received no Jewish education, and I sat in the synagogue feeling conspicuous, as I couldn’t read Hebrew and I didn’t know the prayers or the melodies. I would sit next to my father and braid the fringes on his Tallit (prayer shawl), counting the minutes until we could go home. I continued to feel like an outsider. In 1960 my father got a job at Ford Motor Company, and we moved to Oak Park, Michigan, which at the time was a suburb of Detroit that had a heavy Jewish population. So from being the only Jewish kid in my class, I was surrounded by Jewish classmates. But as the new kid, the shy kid, the kid that got all A’s, I was bullied by the girls for not being COOL! I was still the outsider! My grandfather, an orthodox Russian Jew, came to live with us when I was about 14. He spoke Yiddish and very little English, but showed me his love for Judaism! Every morning (except Shabbat) I watched him put on his tefillin (his phylacteries) and say his prayers, and I spent my teens hearing about the Eastern European Jewish life he left behind in Russia, which became Poland by the time my mother was born there, and the relatives that perished in the Holocaust because of hate of the “other,” – the Jews. All of this laid the foundation for my career teaching English as a Second Language in the Berkley Public Schools to Immigrant adults and children, people labeled as the “other.” I chose to start a diversity club for middle school students, teaching them to take a right stand, to stop just being bystanders, to advocate for the “other,” to stop the bullying that was taking place because of differences in ethnic background, religion, size, sexual orientation, and economic status. One of the programs that I was instrumental in starting was named the Religious Diversity Journeys, and involved selected seventh graders (who study World Religions in their social studies classes) from 5 Oakland County school districts to make site visits to a mosque, a Sikh gurdwara, a synagogue, a church, and a Hindu temple where they spent these special school days learning about different faith traditions! Now 12 years later the Interfaith Leadership Council has taken on this program and it has tripled in size and is incredibly impactful to the students and their parents who attend!! Being involved with the Religious Diversity Journeys increased my desire to teach our youth and adults about religious literacy, to focus on greater respect and understanding and to decrease the myths and stereotypes we have of people different from ourselves! I helped to foster an interfaith initiative called Face to Faith, which impacts high school students of different faith traditions who come together a few times a year at different houses of worship after school. I am the chairperson of the World Sabbath, an annual event to celebrate World Peace through prayers, dance and music from different faith traditions, and that includes our youth as Children of Peace who make peace banners and sing “We are Children of Peace” together. 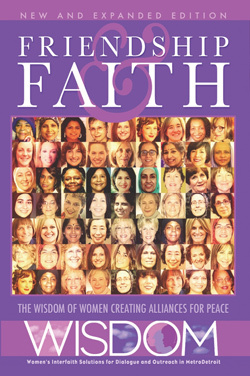 In 2006 I helped to found WISDOM (Women’s Interfaith Solutions for Dialogue and Outreach in MetroDetroit) to bring women of different faiths together to plan faith-based educational initiatives and interfaith social action projects. I became the chair of the Interfaith leadership Council’s Education committee, where we have planned many interfaith panels to address life-cycle events across the faith traditions. As a member of the Temple Israel Board of Directors, I have brought the temple’s Sisterhood and the women of Hartford Memorial Baptist Church together for fun social action projects. I am the co-chair of the Jewish and Chaldean Social Action Committee that brings the two communities together to better understand each other’s faiths and cultures. Interfaith Interaction has become my passion!! My involvement in interfaith has increased my desire to know more about my own faith tradition, Judaism. Because I was not given the opportunity to learn about my faith tradition as a child, I have had a strong yearning my whole life to learn about what it means to be Jewish, and so I have been taking many courses in Judaism and Torah study for the last 8 years. In June of 2012 I had my adult bat-mitzvah at Temple Israel, an event that meant so much to me, and I even had the chance to chant my Torah portion that spring in Jerusalem, not far from the holy Western Wall. So from the angry child who didn’t fit in anywhere, I have found my calling in bringing people of different faiths, races, and ethnicities together who may not have had the opportunity to meet each other in our rather segregated metropolitan community! Being the “outsider” has led me into an incredibly fulfilling world of interfaith in my years of retirement, and I am incredibly blessed!! I look forward to many more years of interfaith interaction in Metropolitan Detroit! GOOD MUSIC BUILDS GOOD COMMUNITY: Brother Al Mascia and Cantor Steve Klaper collaborate at the Song and Spirit Institute for Peace in Berkeley, Michigan. The pope is inspiring men and women around the world-including an interfaith song-writing duo who set Francis’s prayer to music. Today, we are sharing their music video (below) so you can pass it along to friends, your congregation-and anyone else who might be inspired to carry this message further. The Song and Spirit Institute is nationally known as an interfaith community making peace through music, the fine arts (especially the creation of beautiful mosaics led by artist and co-founder Mary Gilhuly)-and service to the poor in many forms. The center in Berkeley, northwest of Detroit, also teaches volunteer to care for the earth in many ways. Klaper says their latest collaboration began with a message from an East Coast friend: “We first heard about Francis’s prayers from Rabbi Arthur Waskow,” head of the Philadelphia Shalom Center and author of the two-volume Torah of the Earth, by Jewish Lights. “Rabbi Waskow sent out word that people should not miss the two prayers at the very end of the pope’s new book. He realized that many people wouldn’t slog through 180-or-so pages and might miss the prayers at the very end. The investigation continues into what led a Chattanooga man who identified as Muslim to go on a shooting rampage leaving killing four Marines. Local Muslims in southeast Michigan are moving forward and embracing their traditions while combating negative stereotypes about them. But the executive director of the Michigan Muslim Community Council says it’s crucial people do not allow acts of violence by any one Muslim to tarnish their community and what it represents. The deadly shooting took place during the Muslim holy month of Ramadan. A time when many Muslims fast to learn self-respect, self-discipline and self-restraint. As Ramadan comes to an end, this community admits it’s difficult to celebrate in wake of a tragedy. As the FBI investigates the shooting to see if it was an act of terrorism, local Muslims say eduction is what promotes understanding and erases fear. It’s a special time in the Islamic world, and in the Ignatian world, too. For the last month, Muslims have been celebrating the holy month of Ramadan, a time of fasting, almsgiving, and praying over God’s revelation. For those at Jesuit institutions – schools, parishes, and organizations inhabiting the spirit of St. Ignatius of Loyola – this July is a celebration of the spirituality of the Jesuit founder, whose feast day is July 31. This confluence of celebrations prompted me to reflect on the points of convergence between Islamic and Ignatian spirituality. As a student of Islam educated in Catholic Jesuit schools, I’ve discovered some profound similarities, or, as the late Trappist abbot Christian de Cherge would call them, “the notes that are in common” between the religions. These similarities can be explained best by pointing to three Arabic mottos, central to the Islamic tradition, and their surprising Ignatian counterparts. The initiate will capture what is being said when the wind blows, the trees sway, water flows, flies buzz, doors creak, birds sing, or in the sound of strings or flutes, the sighs of the sick, the groans of the afflicted. Standing awestruck before a mountain, [the mystical person] cannot separate this experience from God, and perceives that the interior awe being lived has to be entrusted to the Lord. Another phrase of great significance in the Islamic tradition is InshaAllah, or “if God wills.” Muslims use it when talking about the future, to qualify their anticipated plans with the caveat that God is ultimately in control. The frequent mention of God’s will in Muslims’ speech points to the core endeavor at the center of Islam: conforming one’s will to the will of God. The word Islam refers to the peace that comes with surrendering to God’s will, and a Muslim is a person who submits to that God-given peace. That is a notion familiar to those acquainted with Ignatian spirituality. St. Ignatius taught that we must constantly ask ourselves, “What is God’s will for me?” and “How can I live out God’s desires for me, and for the world?” Ignatius wrote that we could come to these answers through prayerfuldiscernment. Islamic and Ignatian spirituality also put a strong emphasis on God’s “greatness.” Each Islamic call to prayer begins with the invocation, Allahu Akbar, “God is the greatest.” It is used to praise and glorify God who is transcendent, grander than we could ever imagine. This phrase of exultation is also used in ordinary life, to express “adulation and exuberance during a sermon or cultural performance, and conversely, even to [communicate] a sense of shock or distress upon learning of the death of a loved one.” Unfortunately, most non-Muslims will only associate this phrase with terrorists. They don’t know that NFL football star Husain Abdullah uses it to give credit to God when he picks off a pass from Tom Brady on the football field. The motto of the Society of Jesus, Ad Majorem Dei Gloriam, “For the greater glory of God,” was coinedby St. Ignatius to remind us that every act we perform, big or small, can and should be dedicated to God. The motto vocalizes the common goal of Christians, Muslims and all people of faith, who endeavor to dedicate their lives to something greater than themselves. Islam and Ignatian spirituality remind us that our existence is made meaningful by this: praising and glorifying God through a life of service to God and others. That’s why I was so thrilled with the title of Pope Francis’ encyclical. Laudato Si’ means “praise be to you” in the medieval Umbrian dialect of Italian spoken by St. Francis of Assisi, who had his own personal encounter with Islam through a meeting with the Muslim Sultan al-Kamil in Egypt. The title made me smile because it could have easily have been named Alhamdulillah – another ubiquitous Arabic term meaning “praise be to God,” the equivalent for our Hallelujah. At a bare minimum, this time of celebration can be an opportunity for our communities to learn more about each other. But it holds much more potential. These days should call us to praise God, not just from the comfort of our own, respective communities, but together, as a diverse community, unified by our shared goals and our common Source. Jessie Ziff is a volunteer in the Public Relations Department at the Peres Center for Peace. Here’s what she told us about her experience with the Iftar Dinner. Never in my life did I think, as a Jewish girl from New York, that I would be celebrating Ramadan, a Muslim holiday. Walking the streets of New York, I am always slightly nervous when I pass a Muslim, fearing that they do not like me. Coming to Israel and volunteering at The Peres Center For Peace is an experience that can almost not be described in writing. Why not? Volunteering here is indescribable. I feel empowered every day. It is an incredible feeling. One that is fulfilling and life-changing. One night in particular I felt exceptionally proud and honored to be here, it was at the Iftar dinner hosted by the center. Iftar means the break-fast during the month of Ramadan. The dinner was a Potluck, meaning that each person had to bring something to contribute to the meal. When I got there, I was greeted by several Arab babies running around. How fun!!! Grandparents came, as well as other relatives of the employees. I had never been surrounded by so many Arabs while feeling as if they were no different than myself. I had a realization at the dinner. I work at the same place as Arabs, I enjoy the same food. I am learning Hebrew, as are some of them. Yes, that might be a childish statement, but it felt so surreal and amazing. I just wanted to talk with them and understand- understand their struggle, understand their lives, understand their stances. I sat with them, and I ate their food. I enjoyed every single second of it. I could not stop smiling. I felt a sense come over me that brought tears to my eyes. My body and mind were going crazy. Thoughts racing. I felt so cool, so mature, so pure and wholesome. I left the dinner and called home; I told my parents that I was just part of one of the most eye-opening, amazing experiences of my entire life. I went to sleep smiling, excited to come to work the next day. When I woke up in the morning, aside from still being stuffed from dinner, I did not even snooze my alarm. I was so eager to come to work and be back in this environment. I feel empowered and humble every single day. I am so happy and thankful to be able to have a seat in this center and work with people who are so passionate about the same cause as I am. A vision that prior President and Prime Minister, Shimon Peres, has and to be able to work towards that is something that I am so grateful for. Something about the dinner really hit home for me. When describing to others about my work here, I lead with a detailed description about the event. I want to talk about it and share my feelings. Since the dinner, I have been thinking a lot about what I can do when I leave the center and go back home. I go to school at Penn State University and I want to be an activist. I want to do something on my own to work towards Peres’ goal. I want to start a program that integrates Jews and Arabs at school. I want to speak. I want to share my experience, and I want to give, and to be given, the chance to come together. I want peace, and I want change. Being here everyday, I know it is possible. To be a Jew and to celebrate a Muslim holiday in Israel with Arabs is proof that if we all come together and work for the same outcome, we will one day reach that. Jessie Ziff is a 19 year old from New York who studies at Penn State University and is majoring in Human Development and Family Studies.